Join Perkiomen in the heart of Philadelphia, Pennsylvania for a tour of the new Museum of the American Revolution, lunch at City Tavern, tour of the Powel House and the National Liberty Museum. 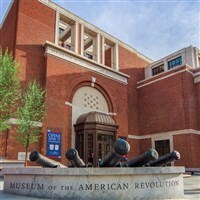 Travel with Perkiomen Tours to the new Museum of the American Revolution. Explore the dynamic story of the American Revolution using an expansive collection of Revolutionary-era weapons, personal items, documents and art. Galleries, theatres and a recreated historical environment bring the events to life. An included lunch at the City Tavern is followed by a tour of the Powel House. Samuel Powel was the last mayor of Philadelphia under British rule and the first mayor following independence. Today we will also visit the National Liberty Museum. Travel with Perkiomen Tours to the new Museum of the American Revolution. Enjoy a journey through the remarkable story of America’s founding and gain a deeper understanding of the people, events, and ideals that gave birth to the nation. An included lunch at the City Tavern is followed by a tour of the Powel House. Samuel Powel was the last mayor of Philadelphia under British rule and the first mayor following independence. He was dubbed the "Patriot Mayor". Many important people have walked those halls...Washington, Jefferson, Franklin, Marquis de Lafayette and John Adams. Included today is also a stop at the National Liberty Museum. Inspiring experiences allow you to interact with incredible stories of heroes.